Where are you? Where are you heading to? Every day we use our knowledge & previous experience to navigate our way in society. Wayfinding has the function to inform & navigate us through our surroundings. An effective wayfinding system consists of a clear & consistent type of design. Here at Signarama Metro Detroit we specialize in this type of design & organization. We also introduce different types of products when a client needs a solid wayfinding sign package in Metro Detroit. 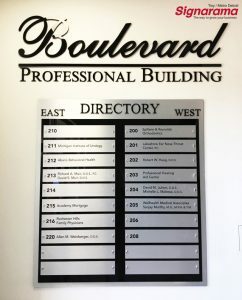 Indoor directional signs can assist people in finding the correct suite in a medical building or locating which floor their appointment is on. By informing your customers to where they are going you are improving traffic flow. This would be extremely important in case of an emergency! Outdoor directional signs are important in directing traffic & control parking while enhancing your brand with a simple yet unique design. Having signage that is ADA compliant, you can improve the accessibility of your business. Our team at Signarama Troy understands that your signage should stand out but not distract attention from the architecture of your building or overwhelm your visitors. This allows your signage to become an integral part of your brand. 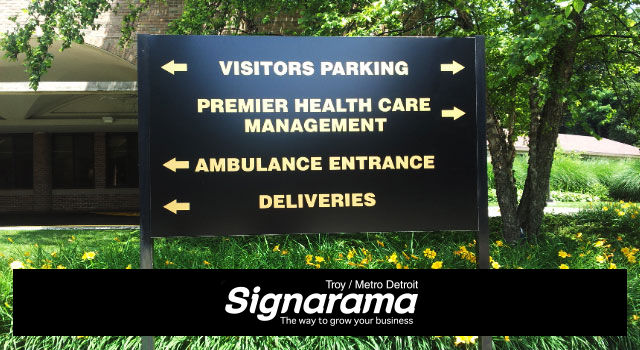 Whether you are a local University or a Municipal City looking to increase your visibility by the way of a clean, concise & professional signage our experts at Signarama Metro Detroit are ready to help with your wayfinding signage package!